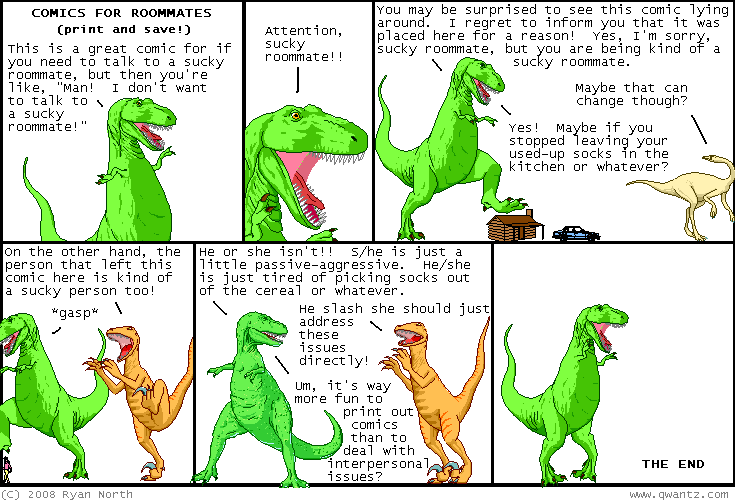 Dinosaur Comics - August 29th, 2008 - awesome fun times! August 29th, 2008: The talented Andrea Heins sent me a song she wrote inspired by one of my earlier comics, about declaring parts of your life non-canon. The song is called "Non Canon" and I listened to it with a big grin on my face, especially with lines like "I will declare your lack of passion for me: non-canon." You can listen to the song on her MySpace page here: if the song doesn't play automatically, click on "Non Canon" in the song list. Her other songs are really good too!